We’d love your help. 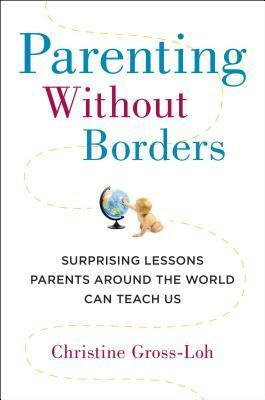 Let us know what’s wrong with this preview of Parenting Without Borders by Christine Gross-Loh. A primer on the world's best parenting strategies—with eye-opening research on the surprising disadvantages lurking in the typical American childhood. Research reveals American kids today lag well behind the rest of the world in terms of academic achievement, happiness, and wellness. Meanwhile the battle over whether parents are to blame for fostering a generation of help A primer on the world's best parenting strategies—with eye-opening research on the surprising disadvantages lurking in the typical American childhood. Co-sleeping, typical in most of the world’s families, may promote independence in kids. American-style “hoverparenting” is unique in the world and can damage a child’s resilience. Finnish children, who rank among the world’s highest academic achievers, enjoy multiple recesses a day. To ask other readers questions about Parenting Without Borders, please sign up. 1) The book gushes about how wonderful parenting is in Japan and how happy children are. Never mentioned is that Japan has one of the world's highest suicide rates. I found online research that showed that in recent years the adolescent suicide rate in Japan has risen to to be twice as high as in the United States. 2) In the section on the importance of recess it says about the Naperville, Illinois school district: "School officials implemented a district-wide PE curriculum that focuses on fitness as opposed to sports, and then had students take some of their hardest subjects after exercising. As a result, Naperville students achieved stunning results on the Trends in International Mathematics and Science Study (TIMSS), a standardized test administered...to students worldwide." My problem with this sentence is the "as a result" part. Naperville is an affluent, highly educated suburb of Chicago and while it may be that the exercise program does help achievement to some extent, it is not the primary reason the students did so well on this test. If the US were to implement a great PE program in all our schools it would not miraculously make us the best in the world at math and science. These are just a few examples. On the other hand, I did enjoy reading about different ways of parenting in other parts of the world and even read out loud some parts to my 10 and 12 year old. My husband and I both taught Japanese schoolchildren in Japan, and there are plenty of spoiled, bratty children running around, yelling at their parents and bullying other kids. There are lazy Japanese children. Destructive Japanese children, even disrespectful Japanese children. I had adult students who disparaged at the lack of respect in young people. Japanese teenagers? Just as moody, sulky, and rebellious as and American teenager can be. Most adults considered that normal. There were plenty of respectful, polite Japanese kids too. Just like there are in the States. I had some awesome students who were helpful and kind and all of the things Gross-Loh believes Japanese kids to be. But they weren't all like that. I also have a problem with how excited she gets about young Japanese children walking to school and running errands all by themselves. It is very easy to do this in Japan, especially in urban areas. School for an elementary student might be a 30-minute walk, probably less. This is not true for a good number of American elementary school students. It would have taken me two hours to walk to my elementary school. It's not fair to compare the two countries in this regard. Not all of the country is like Cambridge. None of the states I have lived in have local rail systems. In Tokyo, it is often the best and easiest way to get around. What's practical in Japan is not necessarily practical in the States. I know that I have read too many parenting books when I pick up a new one and think, "There is no new information here." The title is somewhat misleading, as the author draws from a relatively few number of countries. This book is kind of a Japanese version of Bringing Up Bébé: One American Mother Discovers the Wisdom of French Parenting, with some discussion of the Scandavian countries (and even less about China and Korea) thrown in. Gross-Loh is an American mother of 4 children who has raised t I know that I have read too many parenting books when I pick up a new one and think, "There is no new information here." The title is somewhat misleading, as the author draws from a relatively few number of countries. This book is kind of a Japanese version of Bringing Up Bébé: One American Mother Discovers the Wisdom of French Parenting, with some discussion of the Scandavian countries (and even less about China and Korea) thrown in. Gross-Loh is an American mother of 4 children who has raised them in both America and Japan. She picks multiple parenting topics (sleep, consumerism, food, self-esteem, hoverparenting, play, education, kindness and responsibility) and talks about how other countries do a better job than the United States. She advocates cosleeping, unstructured play-based early childhood education, teaching manners, giving children responsibility and expecting their assistance at home, giving children more freedom in their play. For the most part, it felt like Gross-Loh took the things she liked about Japanese culture and went looking for research to back her up. Based on my kids' experience, I am very wary of the type of very unstructured early childhood education she advocates. 1) many families around the world do not hold the expectation that a child 0-3 be "independent." Babies and children are allowed to co-sleep or families do not expect small children to conform to rule-following until developmentally appropriate. Paradoxically, allowing very young children to be nurtured and, well, babied creates an attachment foundation that leads to greater independence and security in later childhood. 2) at the same time, around the world children 3+ are often given greater autonomy and responsibility for taking care of their belongings and helping the household function. This helps children develop authentic confidence in their abilities and prevents learned helplessness. It helps children when they are allowed to do things themselves, even if that takes more patience and education on behalf of the parents. 3) other cultures invest in fostering awareness of others and kindness in 3+ children. This is prevalent in cultures that value collective harmony, and the value of mutual regard is often reinforced in schools through cultivating the practice of greeting and sharing meals at lunch. 4) It's possible to incorporate elements of cross-cultural child rearing, but it is probably a lot harder to do that in the US, where there's not agreement on how best to parent. The author uses some stories from her own experience to illustrate that; for example, how some parents privilege self expression over being kind, which can result in conflict. I realized while reading this book that, as much as I am supportive of diversity and inclusion, I do wish certain foundations of decorum were embedded in our culture and reinforced collectively, including at school. Fostering responsibility for actions and regard for others (impact vs intention), learning how to disagree respectively, learning how to share meals together--these are super important skills now more than ever. Interesting, well researched book about differences in child-rearing approaches (sleeping, feeding, independence, responsibility) across the US, Japan, China, and several European countries (I don't recall anything about India). While not meant to be a self-help book, the author does give suggestions at the end of each chapter how US parents might adopt some of the parenting styles (e.g., how to instill greater sense of responsibility to small kids, etc.). The big take-away for me is that many o Interesting, well researched book about differences in child-rearing approaches (sleeping, feeding, independence, responsibility) across the US, Japan, China, and several European countries (I don't recall anything about India). While not meant to be a self-help book, the author does give suggestions at the end of each chapter how US parents might adopt some of the parenting styles (e.g., how to instill greater sense of responsibility to small kids, etc.). Very insightful. My biggest takeaway is this: We try to make our babies too independent too fast, and then don't expect them to be independent enough later. In the U.S., we do things like "sleep training" and give our babies their own sleeping spaces so that they'll learn to be independent. But they're just babies--they aren't well-developed enough yet to even know what independence is. So then they spend the rest of their childhoods trying to get the love and attention from their parents they w Very insightful. My biggest takeaway is this: We try to make our babies too independent too fast, and then don't expect them to be independent enough later. In the U.S., we do things like "sleep training" and give our babies their own sleeping spaces so that they'll learn to be independent. But they're just babies--they aren't well-developed enough yet to even know what independence is. So then they spend the rest of their childhoods trying to get the love and attention from their parents they were craving when they were little. We teach them helplessness by not being there when they need us, so they feel they aren't centered enough to be independent and helpful when they're older. This book gives a lot of research on things like co-sleeping (which is actually even SAFER than giving baby their own sleeping place, despite ad campaigns claiming otherwise), education, manners, and the importance of play. The author compares the U.S. to Asian, European, African, and South American cultures in terms of child-raising. The unfortunate result of reading this book is that now I catch myself being really judgmental about how other people are raising their children. So sorry. I'm trying to let go of that. To each his own. I'm also feeling a little daunted about trying to raise a child they way Jacob and I want to raise our future children in the United States. There's just not a lot of support for families, and society kind of has its own set of ideas and expectations about raising children, and if you disagree and try to do something different, you're sort of swimming upstream. Living abroad for a couple of years opened my eyes to the major differences in parenting around the world. As Gross-Loh illustrates, each culture has different parenting priorities and values, but our main objective is for our children to thrive. It was fascinating to read about how different cultures go about this. Each chapter in the book focuses on a different subject (eating, independence, hoverparenting, ect). The author throws out stats, highlights how US parents address the subject, and t Living abroad for a couple of years opened my eyes to the major differences in parenting around the world. As Gross-Loh illustrates, each culture has different parenting priorities and values, but our main objective is for our children to thrive. It was fascinating to read about how different cultures go about this. Each chapter in the book focuses on a different subject (eating, independence, hoverparenting, ect). The author throws out stats, highlights how US parents address the subject, and then will give several examples how other cultures do it. For example, in the chapter on eating she outlines the eating habits of both Swedish and Japanese children. Both cultures thrive in this area, but go about in two completely different ways. By giving several examples, the author shows that there isn't one "correct" way of doing things. She gives info and examples for you to take or leave. YES, there are definitely stereotypes in this book. Not every US parent is over-scheduling their kid and hovering at the playground. But so much of this book rang true. Also, I think some of the examples would be hard to apply in our US culture. You can let a Swiss 4 year old walk a mile to school unattended because the entire community works together to make sure that kids are safe dong this (cars actually stop at every cross walk and look for pedestrians!). Мне понравилось. Практических советов мало или даже скорее нет, но очень занятно почитать про культурные и воспитательные различия разных стран. Много статистических данных, а так же результатов экспериментов. Интересующимся людям будет занятно. Читается легко, быстро и без занудства в отличии от обычных книжек касающихся образовательных моментов. 1. If I had it to do over (my son is 6), I would definitely co-sleep. Maybe not always in the same bed, but in the same room at least. Expecting him to sleep alone caused so much unnecessary stress. 2. Don't feel guilty about not signing your kids up for every activity under the sun. They need unstructured play time. 3. Don't feel guilty about not playing WITH them all the time. That phenomenon is uniquely American. 4. From preschool age on, encourage kids to be as independent as possible and to contribute to the family's well-being (by doing simple chores, for example). I might pick up Finnish Lessons: What the World Can Learn from Educational Change in Finland. -Education! This was actually more applicable for educators, which works well for me! In this book Christine Gross-Loh mainly focuses on child-raising beliefs in he US, Japan, and Sweden; she also shares accounts of parenting/education from Finland, China, South Korea, Kenya and Honduras. Some chapters are a bit repetitive or rambling, I felt they could have been slimmed down. But overall the book was an interesting read. The author examines common cultural beliefs around things like co-sleeping, consumerism, eating habits, self-esteem, helicopter parents, play time, high academic exceptions, and teaching kindness and responsibility. The idea that our children are picky eaters might just be a cultural norm and a marketing strategy that doesn’t have to bind us. It’s possible for us teach our children to eat well. As a friend told me, we wouldn’t offer our child just one kind of book if we wanted him to become an avid reader: we can learn how to do the same with food. Self-esteem doesn’t come from other people telling you how wonderful you are...It comes from overcoming something, from having done hard work, from persisting. Research backs this up: it is parents who allow children freedom and independence within clearly set guidelines, while treating children with respect and love (as opposed to being top-down dictators) who tend to raise confident adults. People with high self-esteem don’t always make good leaders; humility is more of a key trait than self-esteem. People with unstable high self-esteem—a combination of narcissism and high self-esteem—are more fragile and defensive, and prone to anger and aggression. Bullies often have high self-esteem (as did Adolf Hitler), and kids with high self-esteem who also have antisocial tendencies can twist their perceptions of themselves or other children. Forget about self-esteem and concentrate more on self-control and self-discipline. Seventy percent of American college freshmen reported that their academic ability was above average or in the top 10 percent. Chiemi, a Japanese mom living in Tokyo whose two children often played with ours, told me that in Japan there’s a popular saying, “Heavy work in youth makes for a quiet old age.” In other words, working and putting forth effort and facing challenges while you are young will pay off throughout the rest of your life. While in our family David and I would often demonstrate our caring by doing things for our kids, Chiemi demonstrated her caring by having her kids do things for themselves. “In Japan, many people think that the effort you make is more important than the result,” Chiemi explained to me carefully. “This is because we believe that making an effort, facing troubles, and overcoming them really help make you grow. ...researchers are discovering that perseverance is one of the most important keys to success and achievement. ...it’s less about what you’re born with than what you do. Up to a certain point everyone is capable of cultivating skills, even in art or music. But we grew to realize high performance was within reach of anyone if you thought about it as the result of practice and effort. Self-expression was good, but so was giving children a chance to discover the excellence that they were capable of. The reason they performed so well was that everyone not only believed it to be possible, but recognized that mastering anything takes time and diligent practice. Many Japanese adults believe excessive cautioning from grown-ups (“Be careful,” “Stop running,” “Play nicely,” “Slow down”) undermines a child’s growth. In China and in many other Confucian-influenced Asian societies, parenting and education are closely entwined, and learning isn’t just for the purpose of becoming smart and informed—it’s a form of self-cultivation. I began to understand that repeatedly giving thanks and always being polite was a social glue. It helped keep kids and adults from sliding into the all-too-easy habit of ignoring and overlooking others. Always stand in the other person’s position and imagine things from his or her point of view. The more rituals and formulas are practiced, the more deeply ingrained and automatic they become. Sennett explains, “Rituals . . . transform objects, bodily movements or bland words into symbols.” Those symbols, which have such rich common meaning that everyone can understand, allow people to express far more than may appear on the surface. It’s okay that these polite words are “formulas.” It’s not the actual words we say that matter so much as showing that we are thinking of the other person. Sometimes what looks like rudeness in children is actually just social awkwardness. Children are inexperienced in the ways of the world. They can’t magically know how they’re expected to behave if no one has told them in advance. We try to be consistent—we try not to let rude behavior slide—but not overly insistent. I recommend reading the last section “Conclusion: It Takes a Village” first. You will get a good feel for the author’s granola, UNISEF, UCLA-morals, “it takes a village” point of view. If you choose to read the entire book, you will be adequately prepared. I did read the entire book and found it interesting in some parts. It was far from the most interesting or helpful foreign parenting book I’ve read though. The author leans heavily on her personal experiences in Japan and Sweden with anecdotal I recommend reading the last section “Conclusion: It Takes a Village” first. You will get a good feel for the author’s granola, UNISEF, UCLA-morals, “it takes a village” point of view. If you choose to read the entire book, you will be adequately prepared. I did read the entire book and found it interesting in some parts. It was far from the most interesting or helpful foreign parenting book I’ve read though. The author leans heavily on her personal experiences in Japan and Sweden with anecdotal evidence from interviewing expat mothers. I found her “research” a bit suspect. It felt like a collection of opinions presented as scientific research. 7.) Unclear - put more pressure on kids? I highly recommend this book, especially to parents of small children. It's a wonderful reminder/eye opener that what passes as unassailable truth in parenting in the US might be the complete opposite of how parenting happens in other parts of our planet - and the kids thrive. There is some wonderful insight into educational philosophy, raising children who are kind, the age at which children can be expected to take on certain responsibilities, and fostering self-esteem. The only reason I didn't I highly recommend this book, especially to parents of small children. It's a wonderful reminder/eye opener that what passes as unassailable truth in parenting in the US might be the complete opposite of how parenting happens in other parts of our planet - and the kids thrive. There is some wonderful insight into educational philosophy, raising children who are kind, the age at which children can be expected to take on certain responsibilities, and fostering self-esteem. The only reason I didn't give it a 5 is that in many chapters I felt like there needed to be more focus on how the children in the featured country benefited or were harmed by the given parenting practice. For instance, in the chapter on self-esteem, she wrote a lot about the benefit Japanese parents see in pushing their children to achieve, thus gaining self-esteem by achievement. She briefly mentions at the end of the chapter that maybe sometimes this can be taken too far. Knowing that the Japanese have the highest rates of suicide in the world, I felt like the potential negatives could have been more thoroughly discussed. Still well worth the read! This is my favorite genre of parenting books and this is the best one of the bunch. It was organized in a very clear way, and each chapter had a bad American example, positive examples from other countries, and a summary at the end that often showed practical ways to apply those values. Bringing up Bebe sometimes made me say, "no way! Bad idea!" And the Eskimo one (with no Eskimos) was completely impractical, I liked all of these parenting strategies. -Japanese parents tend to go really light on the discipline when their children are young because they feel confident that their children will naturally grow out of all their various stages of delinquency :) and become mature, socially-acceptable young adults... even without a barrage of time-outs, groundings, lectures, etc. Intriguing. 2. Allow time for unstructured play. Planned activities with all the right props are not always the best. Translation: It's okay to let kids get "bored". Then they can get creative. This book offers an engaging and well-researched comparison about parenting philosophies across different cultures. The author is well-traveled and has provided an insightful look at how Americans contrast against people from other countries. I was impressed with her ability to concisely discuss concepts such as caring for infants, the material possessions we buy for our children, the food we provide, how we monitor and educate our children, the way we supervise our kids, the activities we occup This book offers an engaging and well-researched comparison about parenting philosophies across different cultures. The author is well-traveled and has provided an insightful look at how Americans contrast against people from other countries. I was impressed with her ability to concisely discuss concepts such as caring for infants, the material possessions we buy for our children, the food we provide, how we monitor and educate our children, the way we supervise our kids, the activities we occupy their time with, and the morals, kindness, and sense of responsibility we instill in our children. Overall, it's an enlightening book and a sincere attempt to give parents an understanding of different methods of successfully raising children that may be different from our own. I really enjoyed reading this book and got some reassurances that some of my 'lazy parenting' practices might not be so strange or even detrimental after all. Interesting survey that is most heavily focused on differences between Japan and America due to the author's personal journey with some supplemental phone interviews and visits to compare notes with other countries. I would imagine actual parents find this read in part a relief to abandon guilt they aren't micromanaging their child's calendar enough and in part frustrating as many of these "superior" parenting styles are possible because they are supported by a shared perspective from educators, Interesting survey that is most heavily focused on differences between Japan and America due to the author's personal journey with some supplemental phone interviews and visits to compare notes with other countries. I would imagine actual parents find this read in part a relief to abandon guilt they aren't micromanaging their child's calendar enough and in part frustrating as many of these "superior" parenting styles are possible because they are supported by a shared perspective from educators, the community at large, and policy makers. In short, things that will change gradually over years, if at all. This book was fantastic. Wow, so many new insights. Tons of research. Makes me re-think so many of the classical American teachings on how to raise children. I love her global view and also how she shares her experience of living life in Japan and other cultures. It's great to see a book that shows how other countries are doing it right, and Americans aren't the only ones who "know" what to do to raise kids properly. She had some good details and research studies pointing out how these different This book was fantastic. Wow, so many new insights. Tons of research. Makes me re-think so many of the classical American teachings on how to raise children. I love her global view and also how she shares her experience of living life in Japan and other cultures. This book is sort of like Bringing Up Bébé except instead of being an American take on French parenting, it's an Eastern (e.g. Japenese) take on Western (e.g. American) parenting. I loved Bringing Up Bébé, but much of its charm came from how well-written it was, and how candid the author was about her own experiences as a mother and wife, both great and terrible. This book isn't as well-written nor as personal, so it isn't as fun to read. The ideas presented here are great, though. I feel like I This book is sort of like Bringing Up Bébé except instead of being an American take on French parenting, it's an Eastern (e.g. Japenese) take on Western (e.g. American) parenting. I loved Bringing Up Bébé, but much of its charm came from how well-written it was, and how candid the author was about her own experiences as a mother and wife, both great and terrible. This book isn't as well-written nor as personal, so it isn't as fun to read. I thought this book was excellent in how she gave insights into parenting practices in other countries. She talked about the importance of awareness of others and how community has a profound effect on children in other cultures. It was very eye opening to see that things common in American culture were not common in other cultures. If you are looking for different ways to parent your child in an increasingly rude and self centered American society, this book is an excellent place to start. Very intersting book specially if you are into parenting cause it let you explore different parenting ways from various countries. Most of us study and learned and read papers and book coming form UK or USA but never read about Japan for example. The only 2 problems that the author was so biased toward the Japanese experince and she repeated herself many times. But overall great research work that needs to be more explored !! Wonderful insight into other cultures parenting practices. This book was so enjoyable for me. It is insightful, especially for parents who sometimes feel trapped by our culture's expectatations for how children should be raised. It helps to know how other cultures are doing things to help inform decisions about how my own children may be better suited by practices that are not necessarily common or encouraged. A must read for parents. Мне понравилась эта книга. Истории о традициях разных стран в воспитании. Действительно интересно и познавательно. Это не из серии "вот так лучше", а скорее - "а бывает вот так". И это хороший повод задуматься и выбрать для своего ребенка ту или иную тактику воспитания. Very interesting information. Would have liked some kind of "practical tips" section at the end of each chapter or the end of the book itself, but you could do some brainstorming on your own based on the information presented. Really great look at parenting styles around the world. Includes hot topic items Americans think we know the most about, like sleeping arrangements, nursing, feeding, school, etc. Great info for me as a new parent. I really enjoyed this book - some super fascinating stats and trends as well as lots of info on parenting in different countries around the world. I loved this book! I took a ton of notes! Very eye opening and thought provoking.